This year was not see blockbuster movie and only 2 Superhit Movies are there which Toilet Ek Prem Katha and Badrinath Ki Dulhania. Not a single movie reached to 200 Cr. The 200 Cr benchmark expected for Salman Khan Starer Tubelight and Shahrukh Khan Starer Raees but Both Movies failed. Raees Grossed Semi Hit and Tubelight was Flop. Only 5 Movies was 100 Cr Grosser In India including Yoilet Ek Prem Katha,Badrinath Ki Dulhania,Raees,Tubelight and Jolly LLB2. 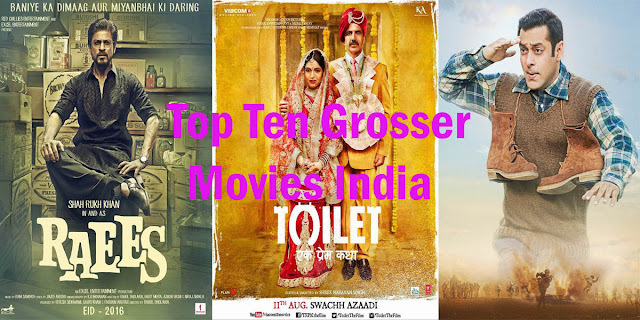 Toilet Ek Prem Katha Topped the chart with the net collection of 132 Cr Approx followed by Raees 128 Cr.